Like many red-blooded males, Mr Rice likes to eat his fair share of red meat, so I decided to treat him to some tasty pork chops for sunday lunch. Heat the oven to 180ºC, line a baking tray with foil and add a knob of butter, then melt for a few minutes in the oven. Meanwhile quarter the parsnips and slice the onions thickly. Then add them to the baking tray and coat with the butter. Mix the honey and ginger with the orange juice and zest and pour half of it over the contents of the tray, then cook for 45 minutes, turning a couple of times. Meanwhile, quickly brown the pork chops on each side and set aside. After 45 minutes, add the chops on top of the vegetables and pour on the rest of the sauce. Turn the oven up to 220ºC and cook for 15 minutes, turning once halfway through. 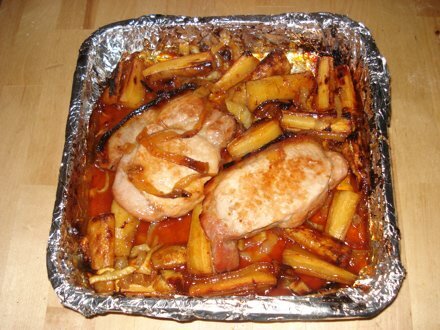 The parsnips and onions will have caramelised and soaked up the juices, which will have reduced, and the pork chops will be nicely browned. Serve with vegetable mash and celeriac dauphinoise. Mash the bananas add them to the bowl of a food mixer with the eggs, vanilla extract, honey and oil and beat until smooth. In another bowl, add the sifted flours, salt, baking powder and brown sugar and stir gently to combine. Then add the banana mixture to the flour mixture and fold carefully together. When it is almost combined, add the pumpkin and sunflower seeds and finish mixing. Transfer to a lightly oiled 750g loaf tin and cook for 55-60 minutes at 160ºC. The cake is ready when a skewer comes out clean. Let rest for ten minutes, then run a knife around the edges and carefully turn out. Slice and eat warm or keep in an airtight container for up to 5 days. It was a lucky coincidence that Mr Rice had just bought a tub of Nutella, so after we had feasted on a delicious, warm slice of the bread, we devoured another one, slathered with the rich, hazelnut chocolate spread – sunday afternoon perfection! *You can use defrosted frozen bananas in this recipe. This is a really simple dish, perfect for supper or lunch, and it combines some of my favourite flavours. When I was a child, one of my favourite dinners was soy and honey belly pork – heat equal amounts of soy sauce and honey, and baste the pork whilst grilling – so so sweet, sticky and simple. Here is a variation of that meal, using different but equally meaty and filling ingredients. The chicken absorbs the sauce well, and the halloumi takes on its distinctive, salty taste as it is grilled, which is enhanced by the basting sauce. Dice the chicken breast and chop the halloumi into similar-sized pieces. Combine the remaining ingredients in a small bowl or pan and heat for one minute, or until the honey is melted and all is combined. Then place the chicken and halloumi pieces onto wooden or metal skewers, baste all over with the sauce and then place under a medium grill. Turn and baste the kebabs until they are all covered and the halloumi is starting to brown. Serve with salad and warm pitta bread. My lovely friend Estelle is having a baby in a couple of weeks, and last weekend was her Baby Shower. It was a lovely, chilled out afternoon with a cool bunch of girls, eating lovely food and talking about baby stuff, amongst other things. Estelle was suitably pampered and I treated her to this special Baby Shower Chocolate Brownie Cake. Melt the chocolate and butter in a large glass bowl over a pan of hot water, or microwave it on high for 40 seconds at a time, stirring until it is all melted. Any longer than 40 seconds and the chocolate will burn and be unusable. Stir it together until it is all blended, then simply add all the other ingredients and stir again until completely mixed. Finally, add the chocolate drops, give a quick stir and then transfer to two 9 inch cake tins – silicon or greased and lined metal – and cook at 180 degrees for 25-30 minutes. Be careful to leave an inch at the top of each tin, as the mixture will rise whilst cooking, and the first time I tried this recipe it overflowed onto the bottom of the oven. Mr Rice was not impressed when he had to clean it up. When the cakes are cooked they will be springy to the touch, but remember that the skewer test does not apply here, as you want the end result to be sticky and moist, not clean and dry like a normal cake. They will be crispy on top and gooey inside. Let the cakes cool fully in the tin. With normal chocolate brownies there is no problem removing and cutting them into pieces when warm – even if a little breaks off. However, it is crucial that this version remains fully intact, and the cooler it is, the less fragile it will be. While the cooling is taking place, make the filling. Simply place the tub of cream cheese and the icing sugar into a mini blender and blend until the mixture is smooth. Then leave in the fridge to firm up. Carefully remove the cakes from their tins and lining paper, if used, and choose the cake with the best-looking top, and place the other on a serving plate. Then smear the filling all over the bottom cake, and sandwich the other on top. Carefully melt the white chocolate in a bain marie or in 30-second bursts in the microwave, and use a teaspoon to drizzle the chocolate over the cake in whatever style you like. Finally scatter the silver balls all over the cake – they will always land on the chocolate. Leave to set for 30 minutes and serve. The filling makes the lower cake even more squidgy and gooey than normal…Enjoy! This has to be one of the most effortlessly cool places to drink in Brooklyn. Low lighting, slow ceiling fans and a dark, mysterious exterior, Brooklyn Social perfectly recreates the Italian Social Club it used to be in days gone by. Screaming subtlety and effortless coolness, it is a superbly relaxed place to sit and chill out, drinking some superb cocktails at the bar, whilst listening to Ella Fitzgerald. You are currently browsing the She likes her food blog archives for April, 2008.